Are you ready to choose the clear choice for a straight smile with Invisalign? You are making a great investment in your oral health and your confidence. Before you are ready to commit to the treatment, you have plenty of questions about what you can expect. At Ridgefield Perfect Smile Center, we have the answers you need to make the right choice. Traditional braces use metal wires and brackets that are attached to your teeth to move them into position. Invisalign does not use any wires or brackets. Instead, a series of custom-made aligners that are made from impressions and images of your teeth are worn to gradually move them. You must wear them for at least 22 hours per day, switching to the next aligner in the series after one week. On average, your treatment will take about 12 months to complete. 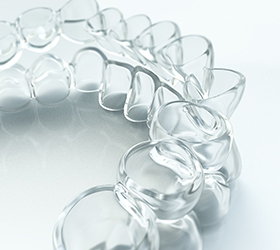 Invisalign aligners are virtually invisible. The clear plastic material is translucent, providing a discreet and sophisticated treatment. To ensure that your aligners stay clear, it is best to avoid eating or drinking anything except water while wearing them. In addition, take the time to clean them each day using a soft-bristled toothbrush and clear antibacterial soap. Unlike traditional braces, Invisalign is virtually restriction-free. Since the aligners are removable, you can still eat and drink what you like; however, it is best to only drink water while wearing them. Your oral hygiene routine will also remain unchanged because there are no brackets or wires to brush and floss around. You will need to take the time to clean your aligners every night. Do I Still Need Adjustments? Since no wires are used to move your teeth, you will not need appointments for adjustments. This provides the perfect solution if you have a busy schedule; however, you will still need to come in every few weeks so we can monitor the progression of your treatment. 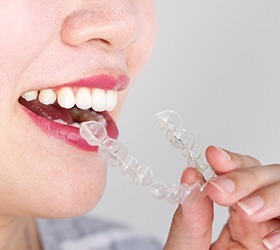 Invisalign can be used to treat an array of bite and alignment issues. If you have large gaps or severely rotated or tilted teeth, you may not be a candidate for the treatment. We will perform a comprehensive consultation to ensure that it is the best option for you. Can I Whiten My Teeth with the Aligners? Unlike traditional braces, you can whiten your teeth while using Invisalign. In fact, it is often encouraged that you use a whitening toothpaste because you can often achieve better results while the aligners are in place. Will My Insurance Cover the Cost of the Treatment? Depending on your specific policy, your dental insurance may cover a portion of the treatment. During your consultation, we will discuss your insurance coverage and payment options to help keep the aligners affordable. If you are ready to start your journey to a straight smile, your first step is to contact our office to schedule your consultation. We look forward to helping you achieve a healthy, beautiful smile.